I began by removing that button entirely. Where we're going, we don't need buttons! 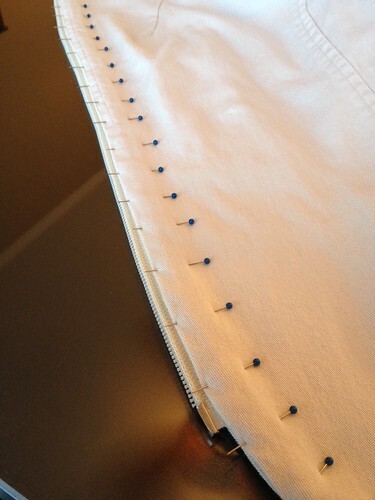 By far, the most time consuming part of this project was seam ripping. 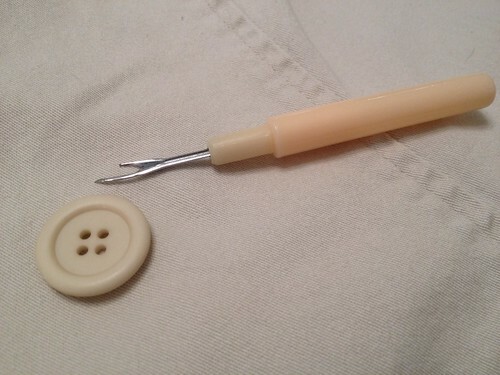 I carefully picked out the front dart seam on the buttonhole side and the front edge on what used to be the button side. 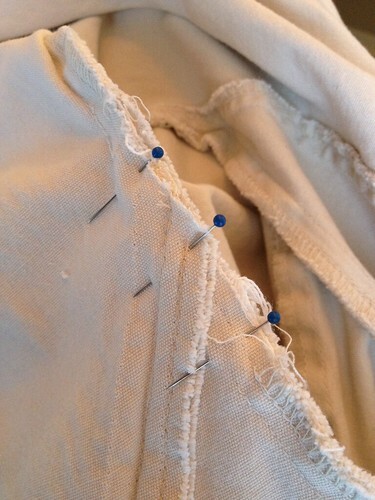 I plan to switch the direction of the overlap, so I won't have to worry about that button hole showing. 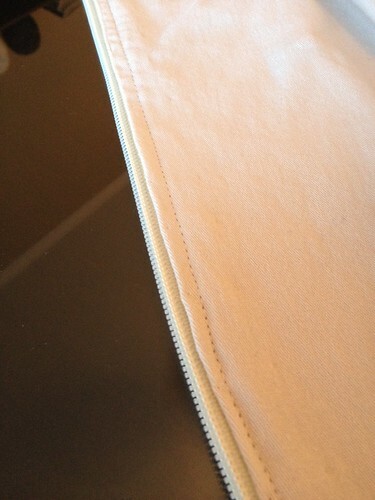 I took one side of a separating zipper, purchased just for the occasion, and inserted it in the dart seam. Then I closed that sucker back up, just as it had been. 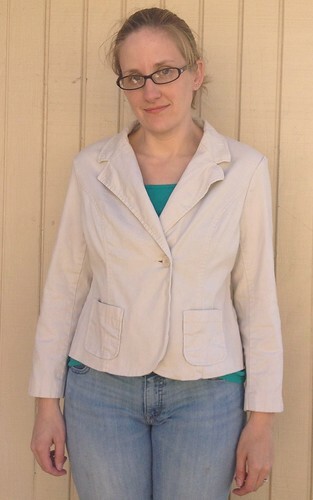 I flipped the jacket right-side-out again and top-stitched along the zipper. 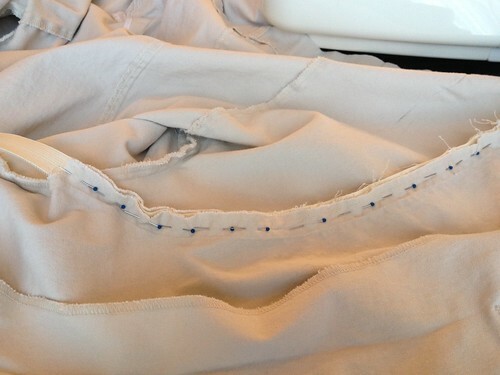 ...and reattached the sleeve at the armhole. 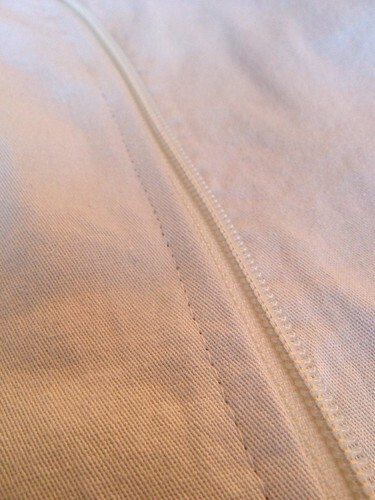 The other side of the zipper was inserted into the front edge where the button had been. I top-stitched all the way down to secure it, and I was finished! I decided not to do anything permanent with the slightly-too-short sleeves just yet. I like the casualness of the cuffed sleeve. I think it complements the style and fabric of my new jacket. Obviously, it's not physically possible to zip the zipper all the way so the lapel point meets the armhole, not while wearing it at least. But I thought it looked nice as a design element to have the zipper go up as far as possible on both sides. 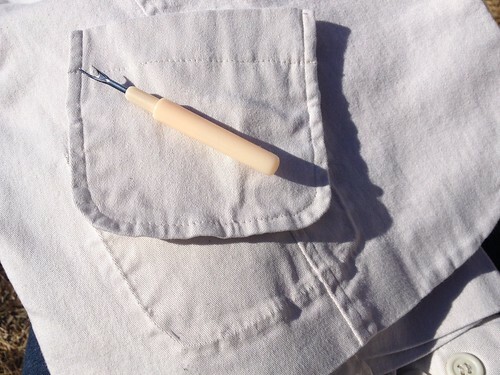 I also considered using a contrasting zipper, maybe a navy blue, but ultimately decided against it as I was worried about it bleeding onto the light khaki fabric in the first laundering. 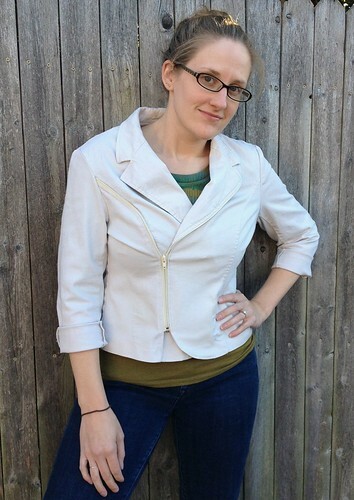 I also contemplated doing something with the pocket fabric, some sort of embellishment, but I felt like this style of jacket calls more for simplicity. And hey, look who's back to her usual shenanigans! That's right, just one week after emergency surgery, and she's already interrupting photo shoots and demanding playtime. 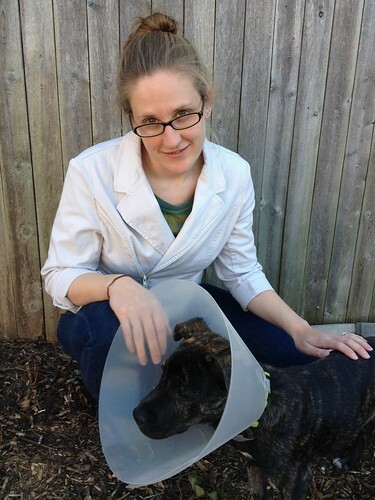 Pretty much the only thing holding her back from 100% puppy mode is that blasted cone, which will come off along with her staples in a few days. Creative and looks very good on you. 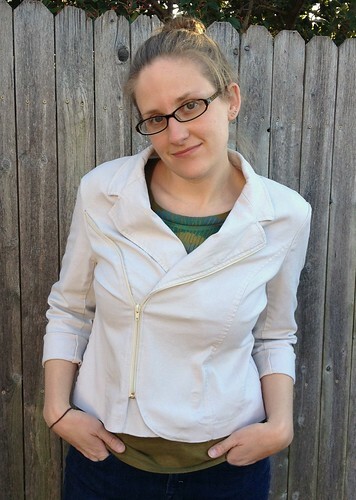 I think you're right about the sleeves, too - turning up can be a design element, too! Thanks, Jenny! And if I change my mind, I can always do something with them later. Wow! You are one creative, talented woman. Great job on this one. 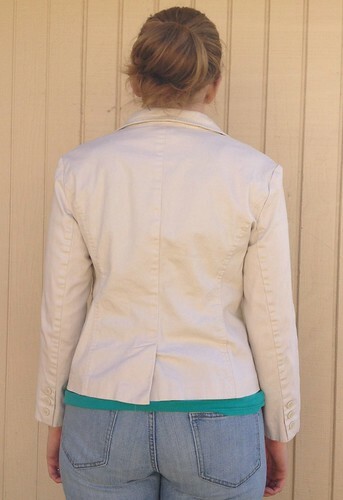 This definitely is an interesting solution for the jacket closure - especially since zipper- edge is a decorative fashion statement at this time!! I really love to see each photo of your work........ as they say a picture is worth a 1000 words!!! Thanks, Linda! 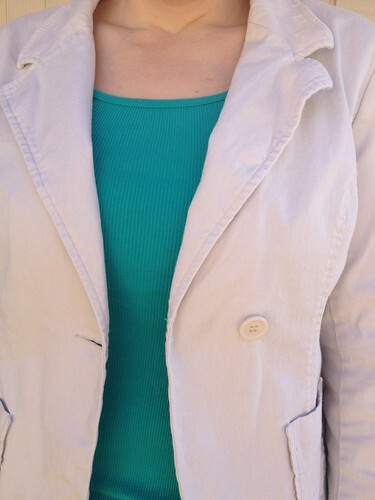 Zippers are really in right now, which is why I thought of doing a contrasting color, to really make it pop. 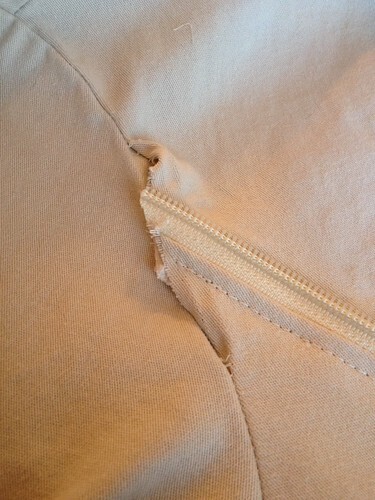 But in the end, I was too afraid a dark-colored zipper bleeding in the wash. That's okay though. 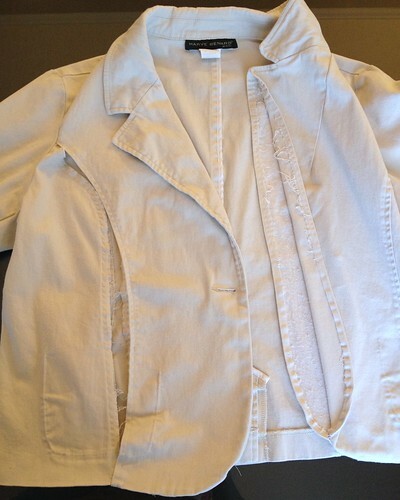 This way, it may be a little less trendy today, but it's also a little less likely to not be trendy tomorrow. I have to say, this is an a-ma-zing refashion! 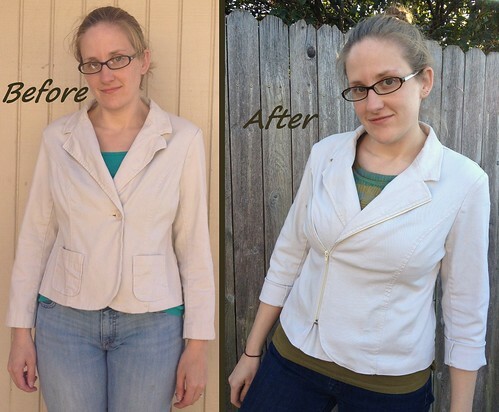 Such a cool idea to turn a blazer into a jacket! And it looks great on you too! Glad to see that your little furry girl is feeling better! Thank you, Aubergine! I'm really happy with how it turned out. Came over from Refashion Coop. What a super cool refashion!!! I love to death how you made the zipper go all the way up. 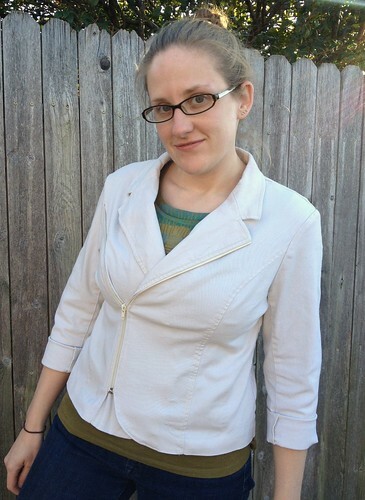 Ooh I love this jacket! I love the asymmetry! Thanks for the tutorial! Thanks! I've already worn it multiple times. It's gonna be pretty heavy in the wardrobe rotation!